Doppelkopf is a card game for four players, which has its origin in Germany. Here are some Tips & Tricks, which can be used as a help to learn the game more efficiently. It is designed for beginners (neophytes), since experienced players (aficionados) know these rules mostly by heart. Queen Solo: Only the eight Queens are trump. All four suits rank Ace, Ten, King, Jack, Nine. Jack Solo: Only the eight Jacks are trump. All four suits rank Ace, Ten, King, Queen, Nine. Trump Solo: Each of the 4 suits can be announced as trump solo. If the suit is diamonds, the usual order of trumps is unchanged. If it is any other suit, the 4 diamond trumps are exchanged with the announced suit; the Ten of hearts remains always the highest ranking trump. Marriage: If a player holds both "Queen of clubs", he can announce "marriage". The partner is the player, who wins the first trick, where the first card played is not a trump. If, after 3 tricks, the partner could not be determined or if the "marriage" was not announced by the player (Silent Marriage), he plays a trump solo (diamonds). The exceptions are declared clockwise, starting with the player to the dealer's left. Players with no exceptions to announce are "gesund" (German for healthy). 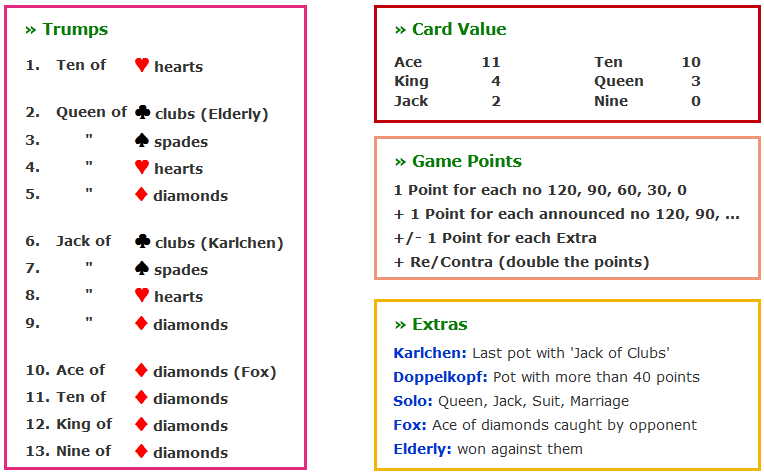 In the case of "Marriage" (in German: "Hochzeit"), the trick which determines the partner counts as the starting point for Re/Contra and also for the announcement of no 90, 60, ... .
Each player must follow the "theme" of the trick, which is fixed by the first-played card of the trick (any of the suits or trump). If it is not possible to follow, they can choose to either play a trump or a card from another suit. Doppelkopf presumably has its roots in a German card game called "Schafkopf" (Sheepshead), but is played with a double pack of cards (so each card is two times existent). All cards below nine are removed, leaving 48 cards (with a total value of 240 points). Doppelkopf is always played with four players. Besides the Solo's, it is a game of two against two. The partners are determined each round by chance: the two players which hold one card of the "Elderly" (Queen of clubs) play together. Since it is not known to anybody, who holds the "Elderly" (in German "Die Alten"), even the partners do not know from the start, with whom they play. It can only made clear by playing the "Queen of Clubs" or by announcing "Re". The dealer shuffles and all cards are dealt out three at a time starting on the dealer's left and continuing clockwise. Each player holds 12 cards. The player to the dealer's left leads the trick (= plays the first card); except for Solo, where the Solo player starts the game. The Elderly (or a Solo) win the game with 121 points (and thus lose the game with 120 points). This cheat sheet (1 page) English rules for the German card game Doppelkopf - Tips & Tricks is available as a PDF-file (40KB) for download. Remark: There are many variations of the rules (in contrast to Skat), and translation is sometimes difficult. At Wikipedia, a more detailed description can be found.